The Academies Trust (“the Trust”) is set up as a company limited by guarantee and has a board of Trustees (also known as Directors). It has exempt charity status and is governed by company and charity law and bound by the Memorandum and Articles of Association. The company was set up to run a number of individual academies. 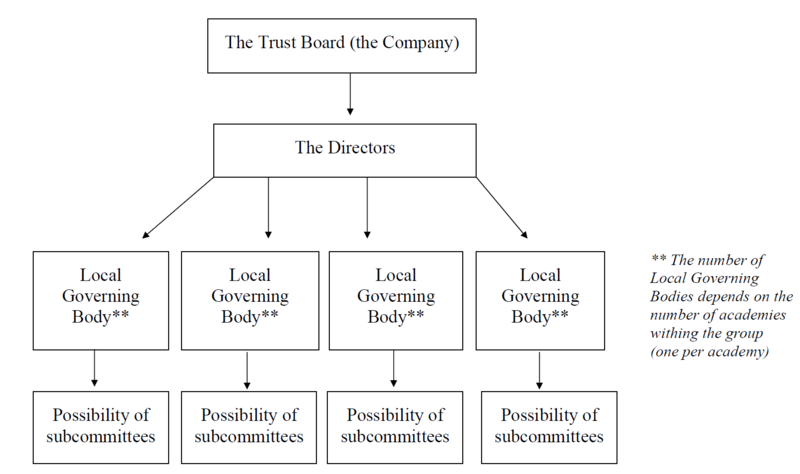 There is also a board of Trustees who may establish a number of committees. A scheme of delegation has been agreed, setting out the matters reserved for the Trust Board, those powers exercised by the Trustees, those delegated to the committees and to the Local Governing Bodies. Who will be represented on the Local Governing Bodies? The Local Governing Body will include parents, staff, the Headteacher, representatives of the community and appointees of the Company. What will the Local Governing Body do? The Local Governing Body does not run the Academy day to day, as their role is at the strategic level in the academy. They are an essential part of the decision making process for the individual academy and for the group as a whole. The Local Governing Body is focused upon the individual school contexts, monitoring standards and achievement and their local community needs and aspirations. The Local Governing Body will help us to improve academic standards by ensuring Trust policies are implemented and will support effective communications between the Academy and its stakeholders. The Local Governing Body will in all cases act within the guidelines set down by the Trust.